1. What are the criteria for pipe supporting? A. Load of bare pipe + fluid + insulation (if any). B. Load of bare pipe + water fill. C. Load of valves and online equipment and instrument. D. Thermal loads during operation. E. Steam out condition, if applicable. F. Wind loads for piping at higher elevation, if required. G. Forced vibration due to pulsating flow. H. Bare pipe with size above 12” shall be supported with pad or shoe. 2. What is the basic span of supports for 2”/6”/10”/24” pipe? Basic span is 5.5m / 9m / 11.5m / 15m respectively. 3. 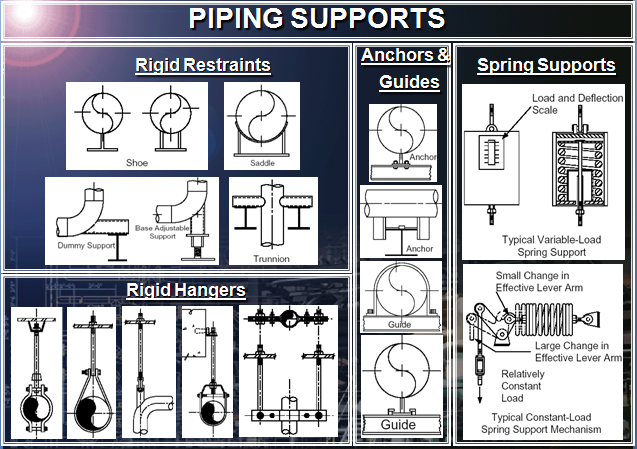 What is the function of providing the anchor, cross guide and guide for piping? Anchor is provided to restrict all the axial and rotational movements of pipe, whereas cross guide is provided to restrict displacements of pipe along with the axis perpendicular to its centerline and guide is provided to restrict the longitudinal movements of pipes along with its axis. 4. How is piping to tank inlet nozzle is supported and why? Piping to tank nozzle is supported with spring type support (first support from nozzle) in order to make the nozzle safe from the loads which occurs due to the displacement of pipe (displacement may be due to thermal expansion of pipe, tank material, tank settlement etc). 5. What are the types of flexible spring hangers? 1. Constant Spring Hanger 2. Variable Spring Hanger. 2 Comments on "Questions Related to Pipes Supports:- Part-1"